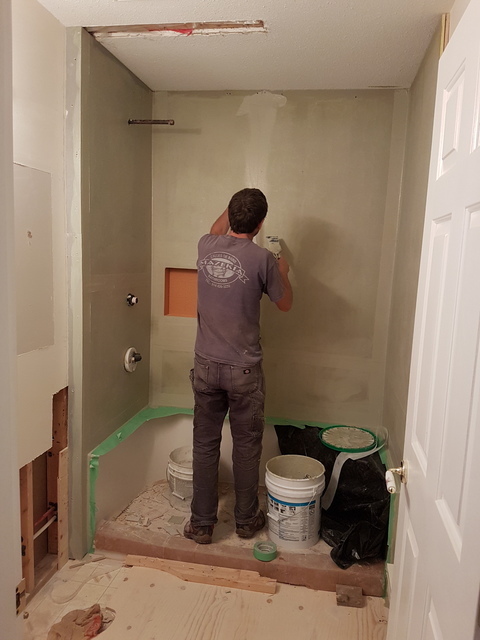 Tim & his team came to my home and transformed my small cramped dark, pay phone booth sized shower into a fantastic, open,bright, walk-in shower. 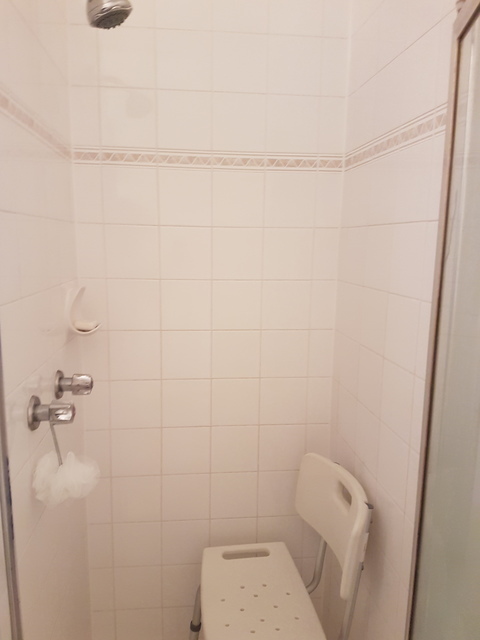 It has a seat, grab bar to assist me in standing, a rain head, and an adjustable shower head I can use sitting down or standing up. All the men including Tim were all polite , friendly, conscientious, showed up when they said they would, and did an excellent job. 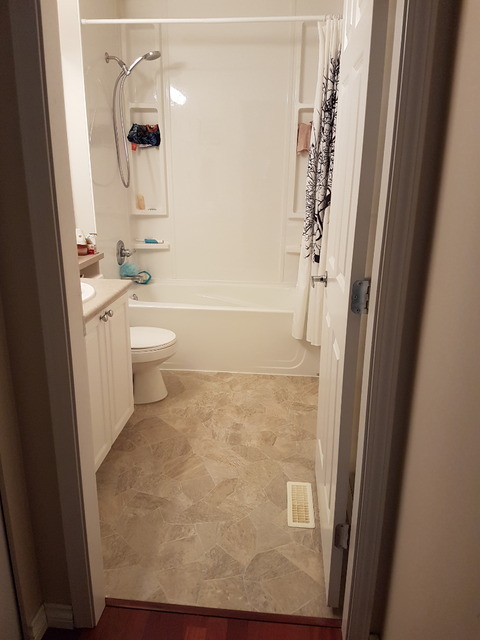 I didn't like the uniformity of the floor before & now I love my stone pattern vinyl floor. 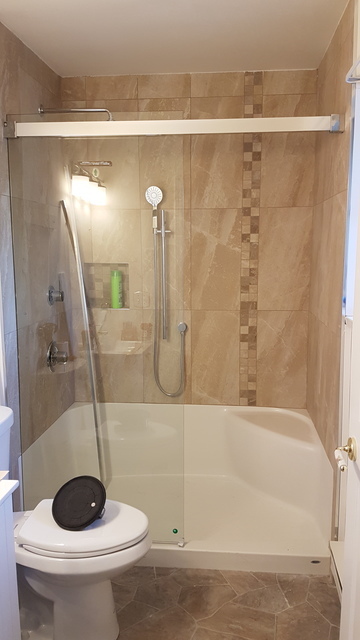 We redesigned Ann's bathroom turning her 32" cramped shower with a chair for her to sit on into a 5' wide walk-in shower with a built in seat. Her mobility issues are now solved allowing her to remain in her home for many years to come. The grab bar we put in allows her to stand and use the rain head shower or sit and use the adjustable hand-held water massage. 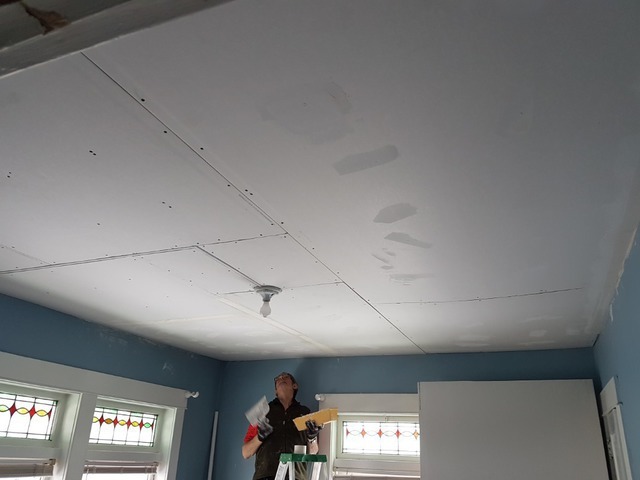 Misty Sands Remodeling helped us out tremendously when our property was flooded this winter. Not only were they efficient, they were also reasonably priced. They were quick to start repairing the damage and 2 weeks later everything was done. I would highly recommend using them for any of your restorations, painting, carpeting etc. needs. Formwerkswas great to work for. The house was almost a 100 years old. First we had to address asbestos containment then deal with the mold and flood damage. This we did quickly so they could keep recieving rent! 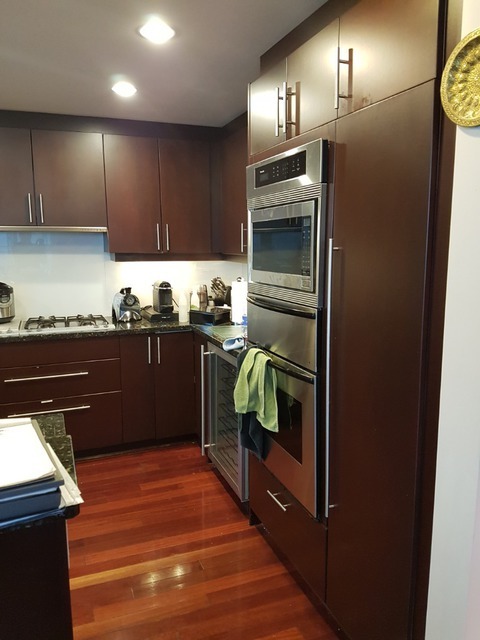 I hired Tim’s team to upgrade my kitchen cabinets by re-staining and refinishing since they were old, dull and damaged by moisture. 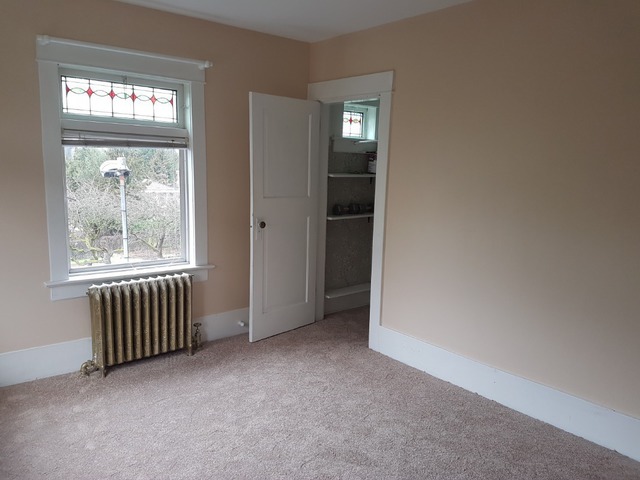 The refinishing work was not up to Tim’s standards and Tim proceeded to replace the doors, the cabinets and the drawer fronts under his warranty. 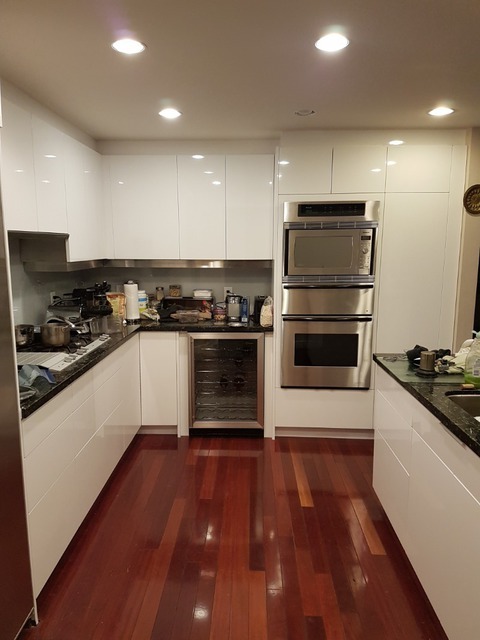 Instead of walking away and leaving unsatisfactory an unfinished job, Tim completed and delivered a superb Kitchen makeover that exceeded my expectations. Tim’s work ethics and commitment to deliver the highest standard has made a difference transforming my kitchen with a new life and light. 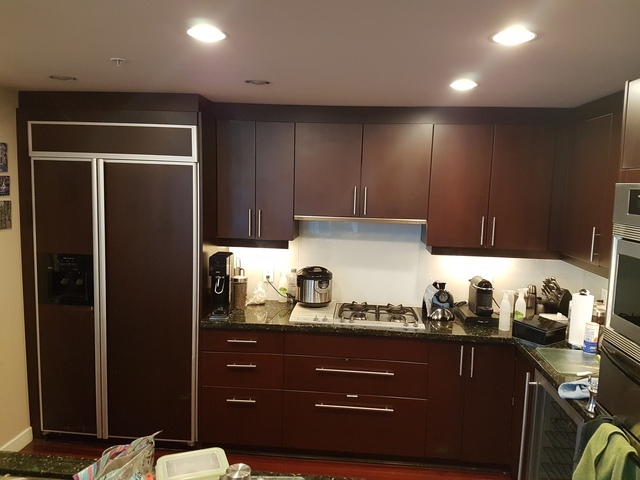 We transformed there penthouse kitchen from night into day by removing dark walnut doors drawers and cabinet fronts and replacing them with bright white ones. 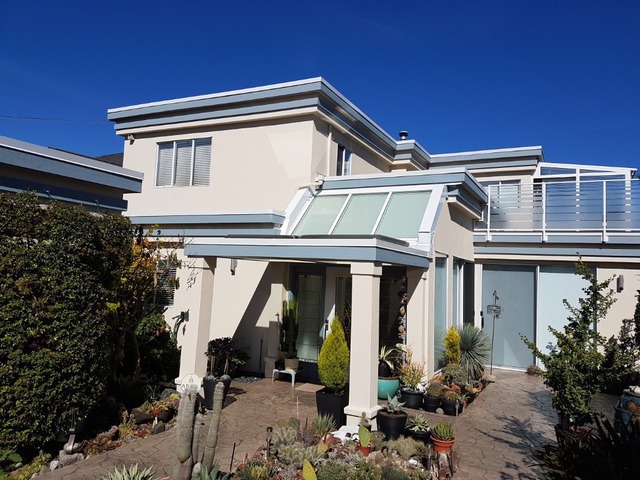 It was a very difficult decision for them to make in the beginning but after we finished the make over they were so amazed and pleased with there choice. Wow !!! See for your self !! 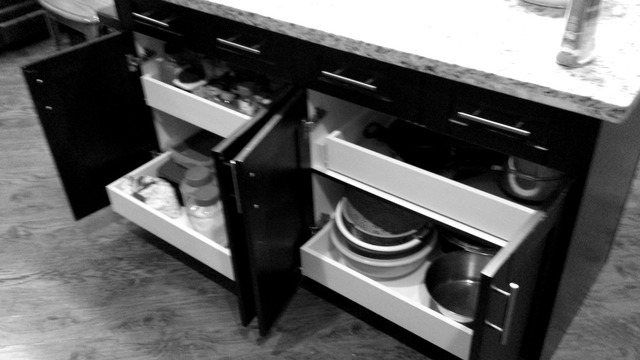 Removing the handles and going with one-touch openers has given there kitchen a sleek modern look. Now they enjoy there kitchen so much more. Went a whole lot quicker than expected given the price, but certainly did the outside well. Cement cutting under 1 hour. 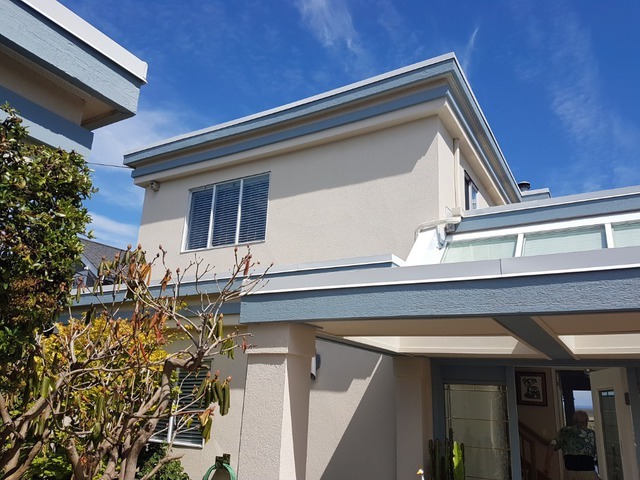 We had a great Team of 4 guys come to your home and provide you with great service which made the job quick and "Well Done"
A team of two painters spend approx. 3 weeks here. They were professional and personal. The cleaned up after themselves every day before leaving here. The house and garage and all the wood trimming were painted twice and small repairs and caulking were done after I was consulted. I would recommend Tim's Team without hesitation. 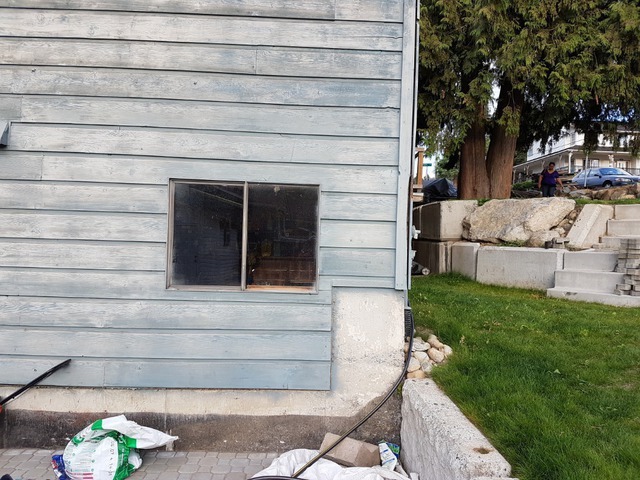 Tim's Team was called in June to repair acrylic stucco damaged by a glass contractor who left job incomplete and didn't fix it. We did an excellent job of repairing stucco and matching the exact texture. They felt relieved they found us to help them. They said that "this gave them confidence to choose Tims-Team again for a much larger project. 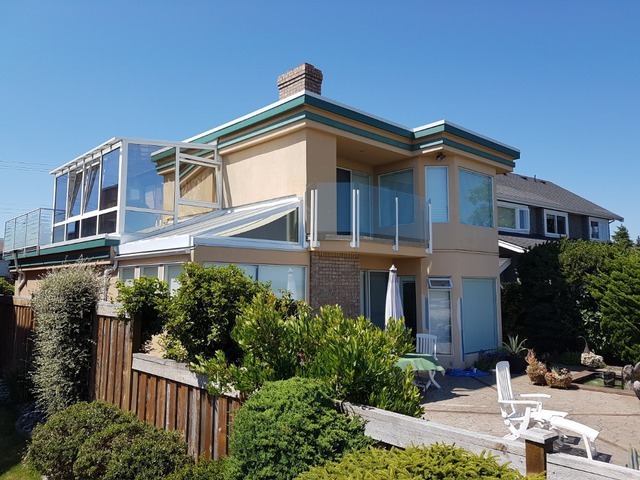 We painted their Ocean front home and garage with an Elastameric coating that protects it from wind,rain, sun, and salt air for years to come. They said "our home looks like new "
I'll have to walk wider around cactus those barbs hurt! What a pleasure to work for you ! 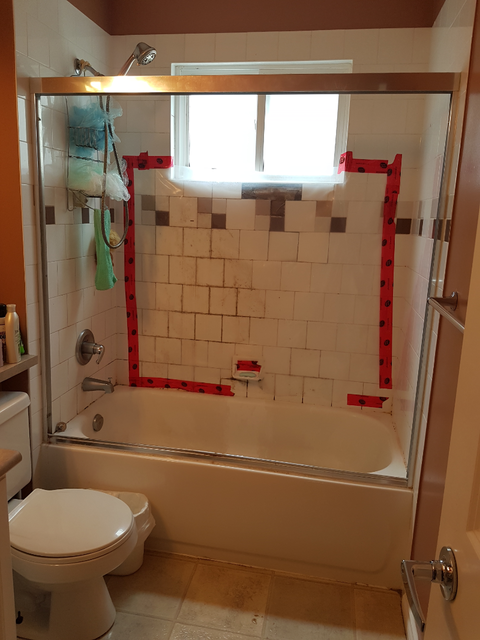 I was having problem with the glass shower door in one of the bathrooms in my house. It was leaning and rubbing against the base tile wall underneath. As a result, the grouts at the tile joints were cracking and coming off. 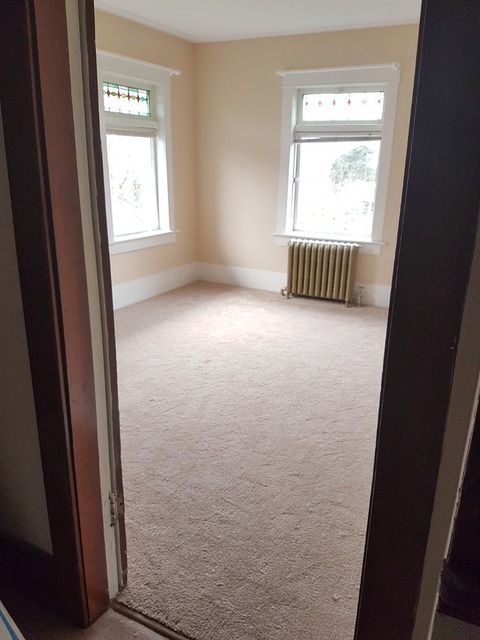 I found Tim's contact on Homestars. He was very prompt in responding to my text and even came out after hours and, as far as I recall, over the weekend to see the problem. He was quick to identify the problem and kind enough to send his glass guy next day. The glass person was very professional, raised/levelled the glass door and fixed the problem within an hour. I am thankful to Tim for his help. He seems to be a very nice person. 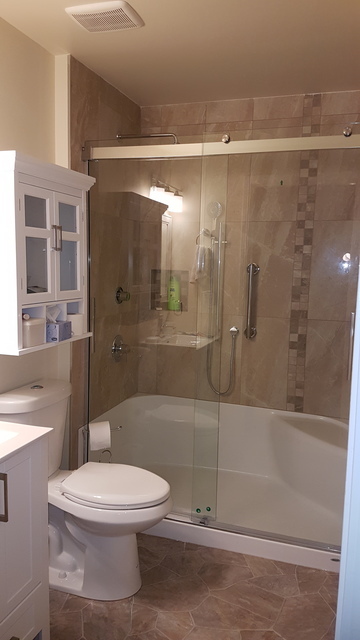 Thank you Pritham for calling Tims Team to repair your main walkin shower that was done incorrectly by another bathroom contractor & lack of service. Tims Team was able to respond promptly on short notice preventing further damage, by fixing glass door to walkin shower. We re-installed door and repaired tile. 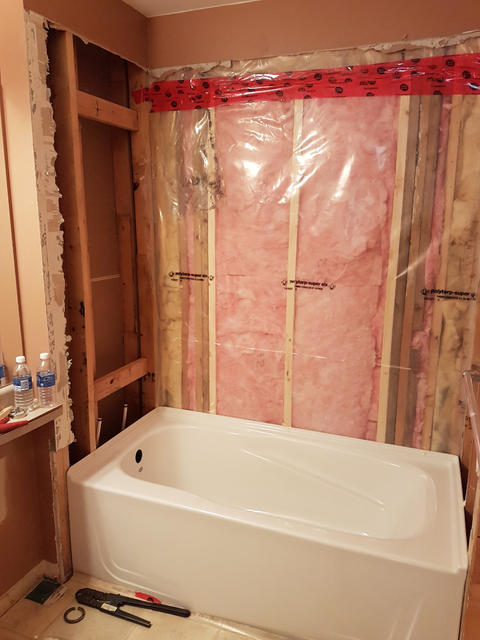 We look forward to doing further work for you and your friends that are seeking quality remodeling. TIM'S Team is fast and professional. Tim explained all pros and cons and gave us a good advice. Our glass roof looks gorgeous. It is easy to clean. Thank you Tim. You created a great team. 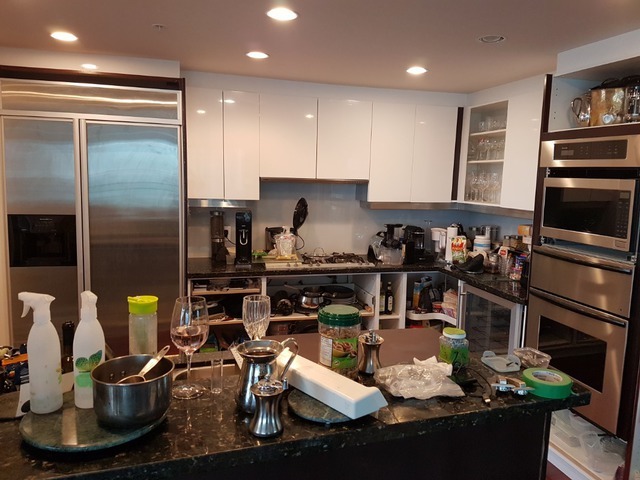 Tim's Team did a small renovation on my kitchen which radically improved the organization and efficiency of my kitchen. 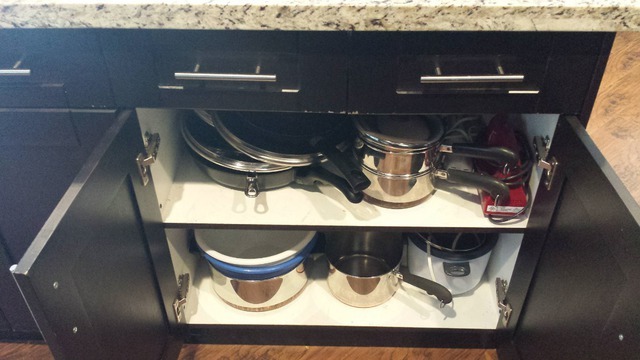 Adding pull out drawers to all of the lower cabinets makes it much easier to find things. They hold more things and I no longer have to crawl on the floor to reach items in the back of the bottom shelf. 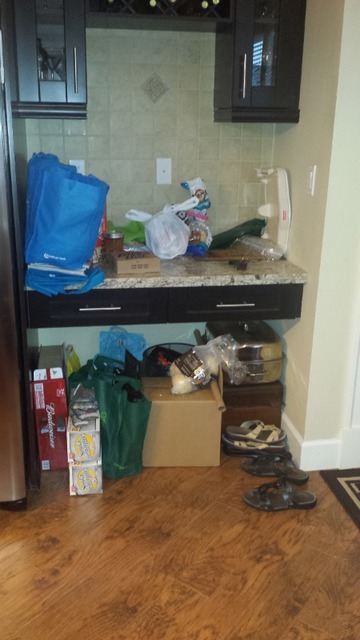 Tim's Team also took a kitchen desk area that had become a junk collection spot and turned it into a useful work space with a new cabinet below. 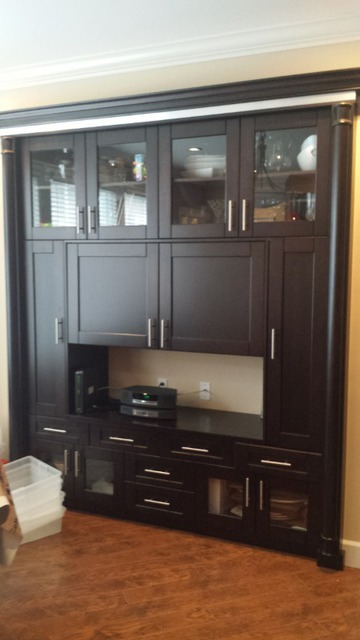 New cabinets were also added to a pre-existing built in area to provide additional storage. 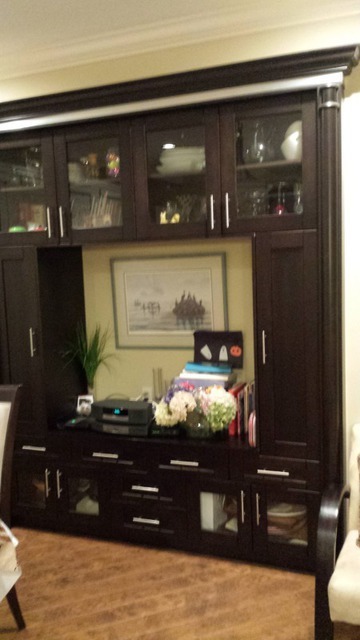 All of the new cabinets matched perfectly with the old ones, even though they were built especially for this project. I was very impressed with the thought and planning that went into this project. They measured and triple, even quadruple checked everything. His crew were extremely skilled, prompt, courteous and efficient. Tim was on top of everything and ran the project extremely well. Things happened when he said they would. Trades people showed up when they were supposed to. Everyone was very pleasant and professional. 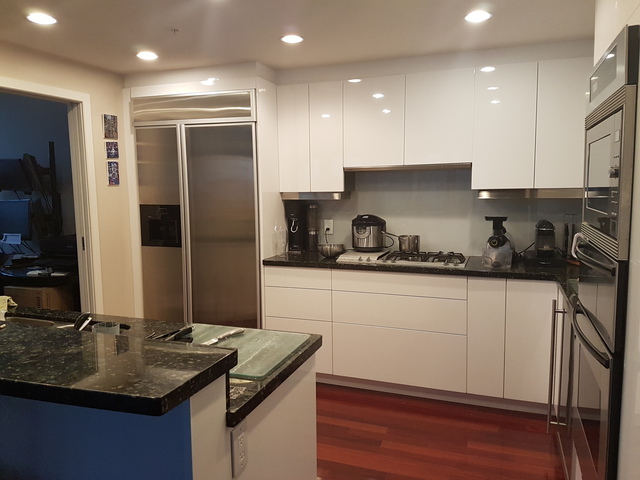 The project was completed on time with as little disruption to my home life as was possible. FYI, a new wall and double pocket doors were added to a room in my basement to turn a recreation room into a bedroom. 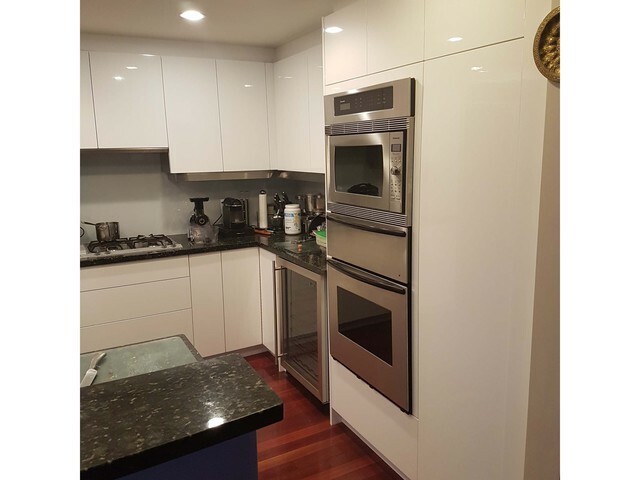 This was also a small project but was completed with the same quality and care as the kitchen project. The price for this additional project is included in the approximate cost noted below. 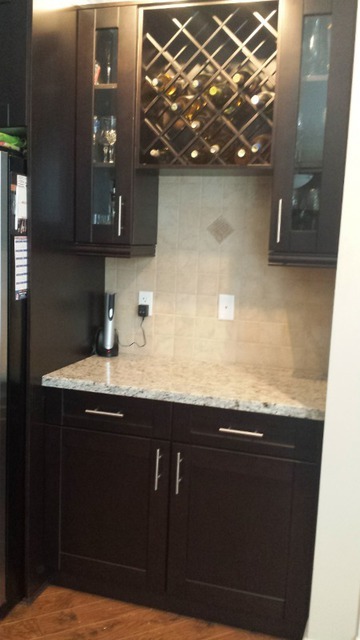 I would not hesitate to recommend Tim's Team for any renovation project you are considering. Tim is very experienced, has great ideas, does excellent work and hires extremely qualified and talented sub-trades. I would like to thank you for the excellent work you have done for us. I was in a tight situation when the lighting in our Men's Washroom stopped working late on a Friday afternoon. 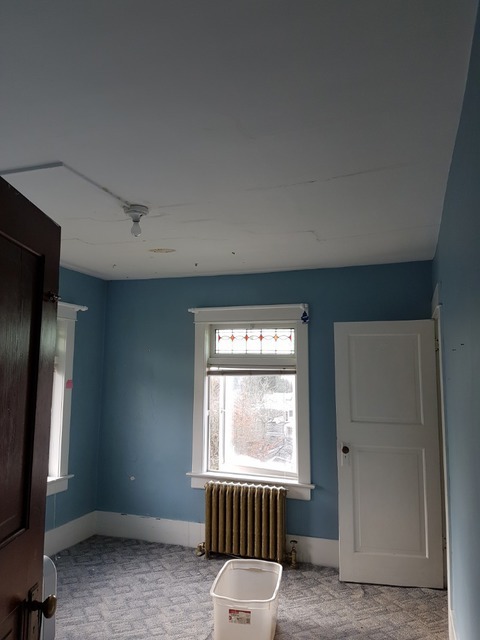 He was extremely quick to respond to my questions, and was able to arrange for an electrician to have the work completed before Monday morning. 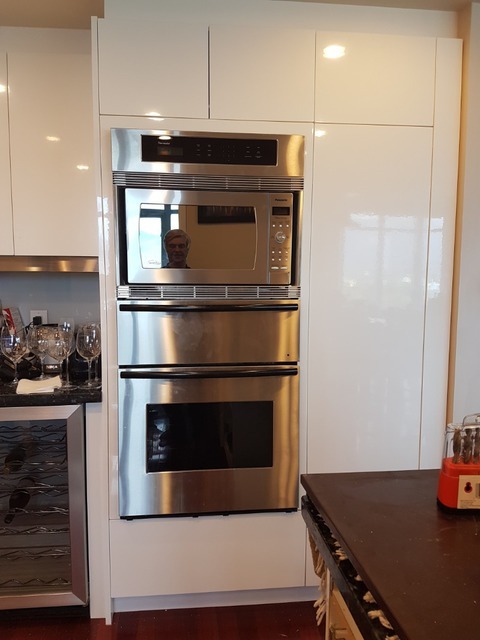 I am very pleased with the work that was done, and I'm impressed with the efficient and pleasant service his team provided. 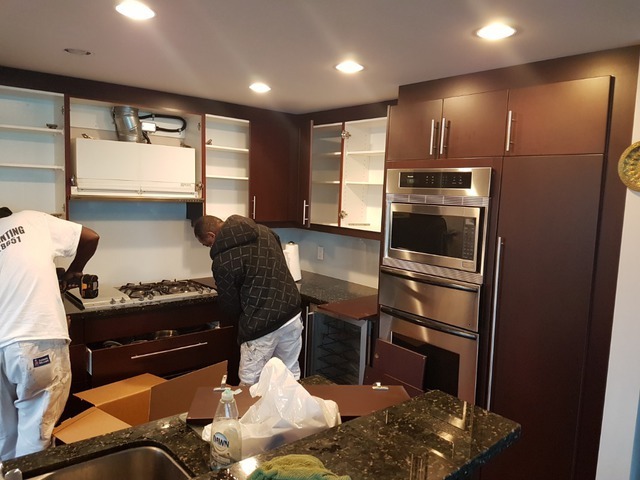 I'm very happy that I found Tim's Team, and I will not hesitate in recommending his company to others I know, who are looking for repairs or remodeling! Thanks for the GREAT review Jim! At Tim's Team, our #1 goal is to provide quality work that puts big smiles on our clients faces! 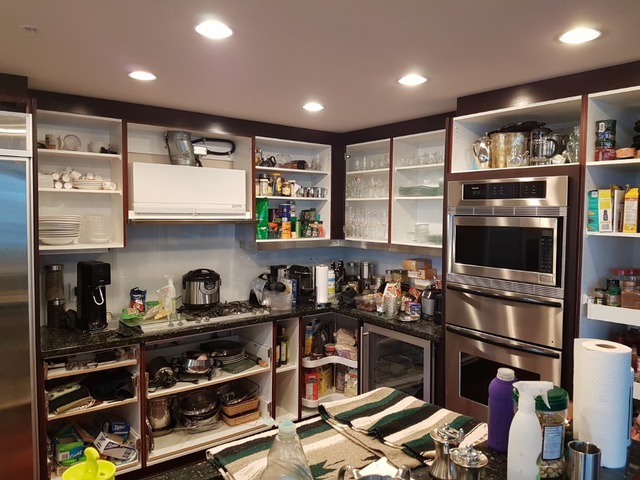 No matter how big or small, the job always gets done right - from emergency repairs like your electrical work, to larger projects like bathroom or kitchen renovations. Always happy to help! 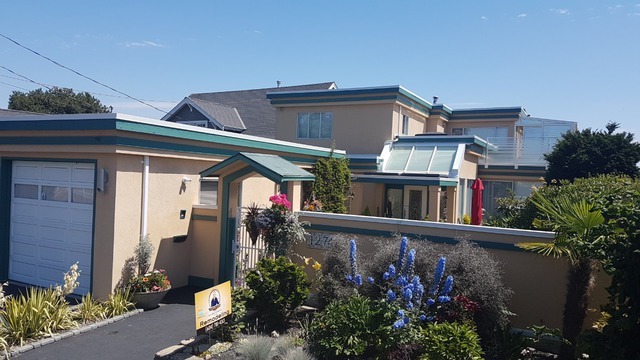 Family owned and operated since 1983, we perform all levels of building, additions and home renovations and remodeling. 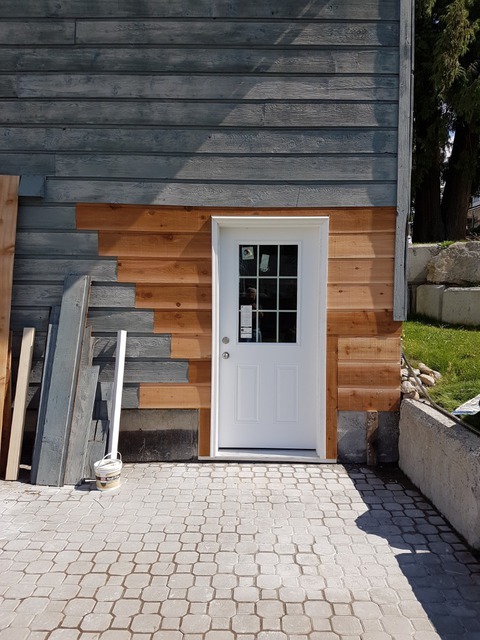 We offer start-to-finish solutions for every project and perform Quality interior & exterior home renovations. 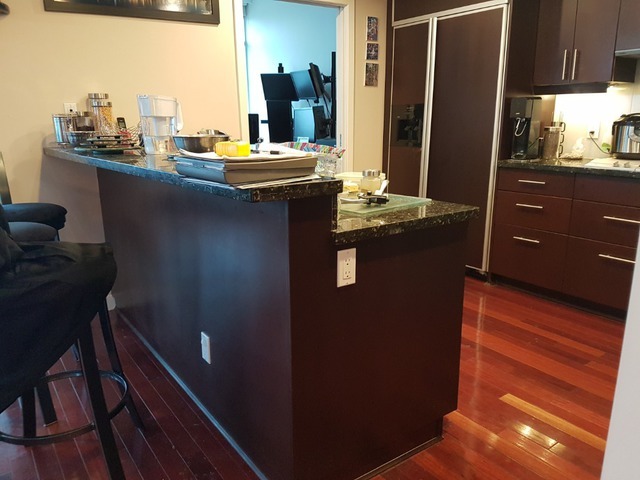 we have redone many jobs that were installed incorrectly and made the owners very happy. 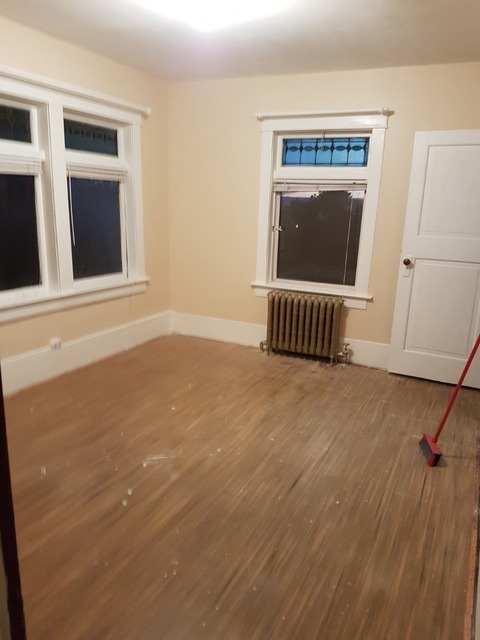 Recently we helped owner with removal of a illegal suite & strengthen floor to keep the extra 350 sq.ft. 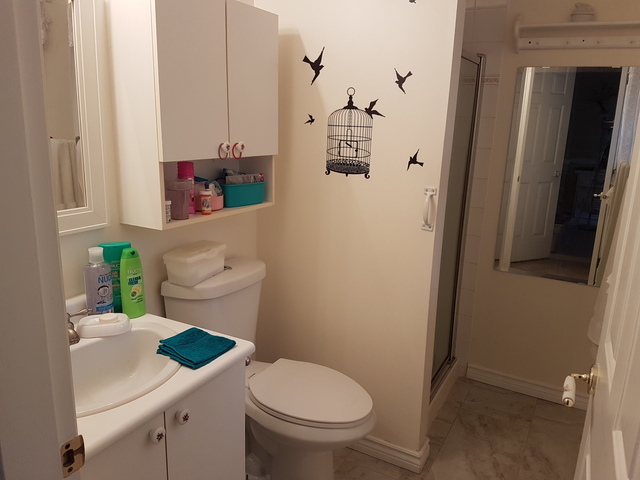 and a bathroom by getting a variance from the city. 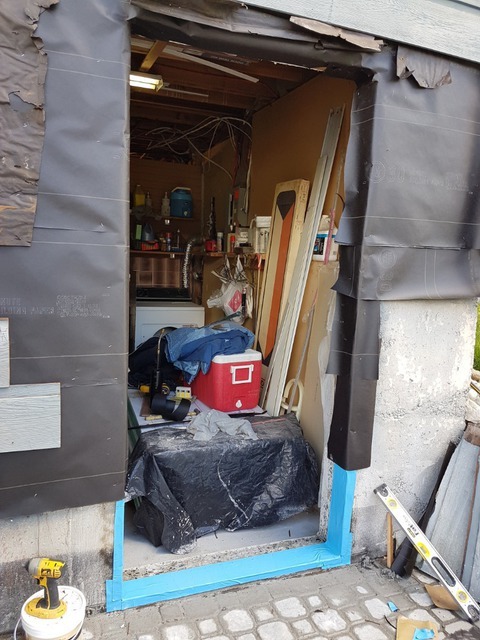 What a process to retain a extra fire escape door,landing & stairs thereby helping owner get licence for an 8 children daycare and open for Sept 5 Yeah ! 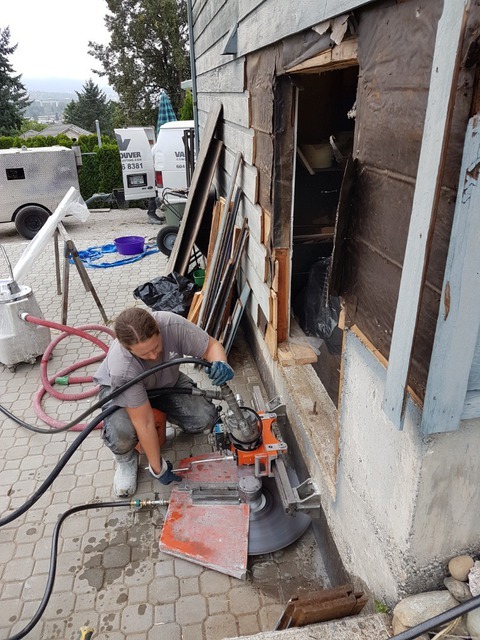 We specialize in beautifying bathrooms and kitchens, decks, windows & siding, drywall and painting stamped concrete, roofing, solariums ... Our expert tradespeople craft small additions, carriage homes,garages and more! We guarantee high-quality construction for each and every project. 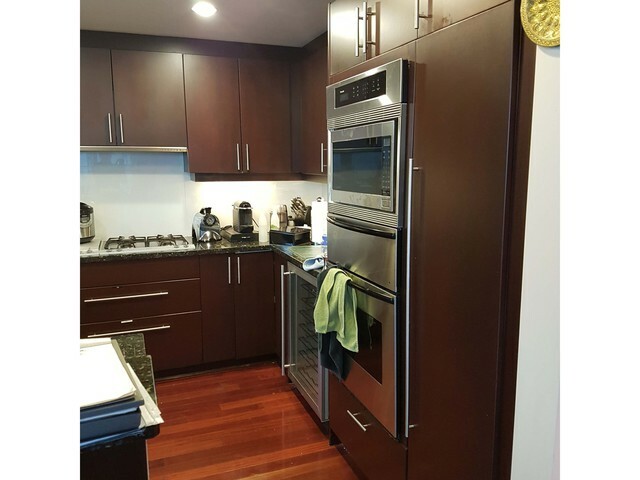 Check out samples of our recent work,and you'll agree that we're the best choice for your home renovation project. The job isn't complete until the customer is satisfied.